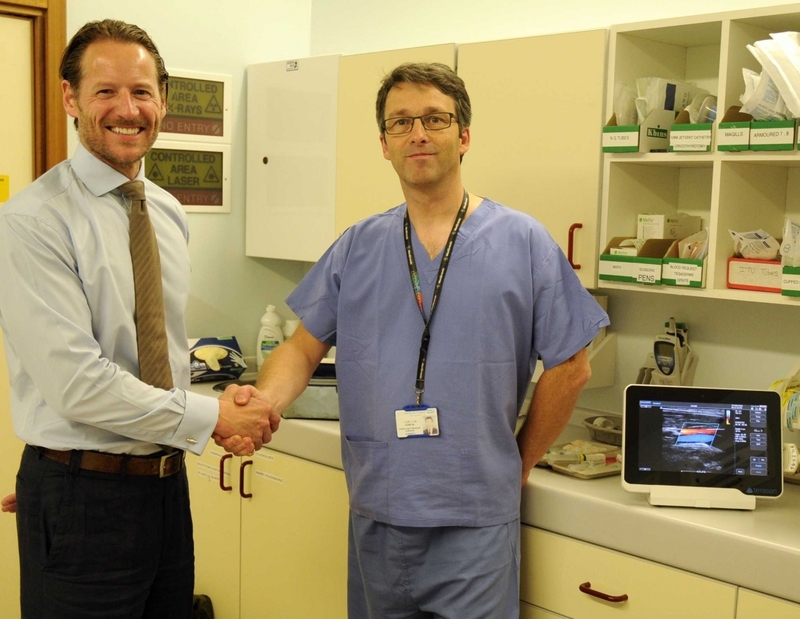 Pictured recently at the Royal Devon and Exeter Hospital are (from left): Vertec Scientific product specialist Gavin Adcock with consultant vascular surgeon Mr Andrew Cowan. The visit marks the handover of a Terason uSmart 3200T compact ultrasound system, supplied by Vertec and funded by the League of Friends from Tiverton, Okehampton, Axminster, Ottery St Mary and Exmouth Community Hospitals. The scanner is for use in the community setting to save many patients a lengthy journey to the vascular hub from rural towns and villages. Imaging and surgery of the vascular system is becoming increasingly important. This may be due to increasing numbers of treatable vascular disorders as well as improved diagnostics that can lead to early detection of and intervention for vascular diseases. In diagnostic imaging, the technological advances in ultrasound have greatly helped this progress. In addition to the exceptional image quality of the Terason uSmart 3200T, surgeons benefit from a system that is fast, accurate and highly portable, while the tablet design of the uSmart3200t allows for finger swipe operation that is intuitive, easy to use and makes cleaning very simple.